What was life like before Google, before Facebook, before Twitter? Google and Facebook blew up while I was in college. I was one of the early facebook adopters when facebook was only for those who went to college. So I remember life before all this crazy stalking business begin, when a stalker was someone who followed you around and hid outside in the bushes. Were are all guilty of it, looking up someone who we used to go to school with, someone we used to date, someone we used to like, or currently do. We all do it. We all stalk whether we want to admit it or not is another story. I admit it. I am totally guilty of the all the things mentioned above. My 10 year reunion is this year, there is a facebook group devoted to it. I’m not friends with a lot of the people I went to high school with on facebook, but most of them are in this group, as am I. Have I looked at their profiles, yes. Do I know how many kids they have, what they look like, and what their spouse looks like, yes. Thank you facebook for turning me into a stalker. And I know I am not the only one guilty of this. How do I know this, because some of these kids have commented on my photos, so they to know whatever I alloy them to by means of facebook. I miss dating pre-social network. It’s a whole new ball game now that we have so many outlets to “get to know” someone. Every guy I have dated since this phenomenon has occurred has first pursued me on facebook or myspace. I met him in real life, but then he would find my profile, add me as a friend, and then begin to message me. This all went on for weeks, sometimes months before an actual date took place. You can find out a lot about someone by seeing their profile. It’s kind of weird. Not only do we have social networking, but we also have Google. Oh Google you make stalking so easy. I Google guys before I go out with them, and so do most girls I know. I know more about them then I should thanks to Google. So what happens when you have been to sick to go to work, but not sick enough to sleep all day long? 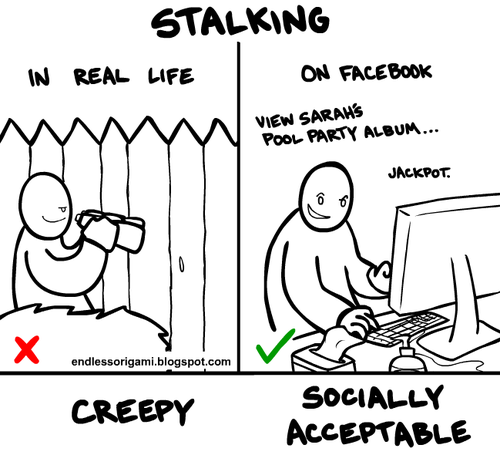 You get really good at your stalking skills. Oh and you might do things that are out of character for you as well. Not feeling well, and bored, I decided to peruse match.com. Made a profile, with no intention to ever pay for it, or even put up a picture. I have a lot of friends who have met on dating websites and those friends are very happy. So I thought I would just see “what’s out there”. You can see people’s pictures and see their profiles without paying. I got matched with a really cute guy. Like to cute to be on a site like match. I showed my friend Rachel his profile. She agreed, it’s got to be some sort of scam, as in he is either not honest in his pics, or he is just a creep. I decided to find out. So I did a Google search on his name along with a little bit of info on his profile. Bingo…Found! (I always knew I would make an excellent spy.) So I think it is the cold medicine taking over, but I did something completely out of character. I found him on facebook and sent him a message. He wrote back…probably won’t turn into anything, but wouldn’t it be fun if it did?